The Kodak Monitor was the end point of Kodak's line of folders with flipup finders. It was also the heaviest and about the same dimensions as the later Tourist. Monitors were made in several models with the primary differences being the quality of lenses and shutters and film size--monitors were made for 620 and for 616 film. There were other minor differences that followed price points. Monitors were distinguished from other Kodak folders made in the 40s by having more advanced film handling. While they still had the ruby window, they also had a toothed roller that drove a film counter that registered frames on a dial atop the camera. This added about 3/8-inch to camera height, making the Monitors taller than the Kodak Juniors, Seniors. Vigilants and Special 620. Monitors had a body release, but in my experience, it is less reliable than a similar arrangement on the Kodak Senior. The Monitor's release sometimes hangs up because the linkage doesn't get positioned right when the camera is opened; early Monitors seem more prone to this than later ones. The Monitor's flipup finder has good quality optics and is generally brighter than enclosed finders, like the one on the Tourist. Vigilants were essentially monitors without the advanced film handling. Seniors and Specials were a generation earlier, but often have similar lenses and shutters. Of course the Monitor's biggest deficiency is that it lacks a rangefinder, not trivial on the 616 model with a 126mm lens. There is a workaround for this problem, though not the equivalent of a coupled rangefinder. Kodak and many small German manufacturers made accessory rangefinders that slipped into the accessory shoe. All Monitor optics were scale focusing and were the highest quality lenses and shutters on Kodak folders. These were Kodak Anastigmat and Kodak Anastigmat Specials originally three and four element designs using uncoated glass. Early Ektars had soft calcium fluoride coating on inner surfaces, but this was apparently not done to Anastigmats and Anastigmat Specials. KA/KAS lenses made in 1944/45/46 may have hard coatings even though they are not identified as such. After about 1946, Kodak began hard coating these lenses and renamed them Anaston and Anastar, although coated KAs and KASs can be found. These lenses are very sharp and, except for not being as well color-corrected, approximate the quality of the contemporaneous Ektars. 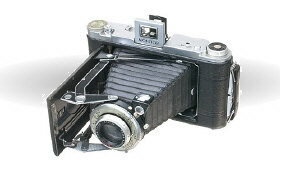 Kodak used two shutters for the Monitor; f/4.5 lenses were mounted in Supermatic and Flash Supermatic shutters (1 sec through 1/400); f/6.3 lenses were in Kodamatics and Flash Kodamatics (1/10 through 1/200). In general, coating and shutter synchronization occurred together. Chris Perez has published lens resolution tests for an uncoated Anastigmat Special used on the Kodak Special Six-20 , a contemporary of the Monitor. Do not dismiss the f/6.3 Kodak Anastigmat (Anaston) on the Monitor. From about 1946 Kodak used the term 'Lumenized' for its hard-coated lenses and marked them with an symbol following the lens serial number. Although the coated lenses are clearly preferable, uncoated glass can produce good results. In either case, with early lenses it is especially important to use effective hoods and multicoated filters will also help reduce flare. Both the Monitor and Vigilant, as well as the earlier Special, Junior and Senior folders were made in 616 models, and as current day users, these cameras provide an attractive capability--a negative that measures 2 1/4 x 4 1/4--that provides a moderate panoramic format. While earlier Kodak folders were commonly available for rollfilm sizes that produced images of 4 x 5, modern bulk rollfilm to respool these sizes would be a custom product, so the 616 folders are, in some sense, the last of the large format folders. Spooled film for 616 has been long discontinued, but that impediment can be managed by rolling 70mm bulk film onto 616 spools with 616/116 backing paper . 616 is the same size as 116 except that the spools have smaller diameter centers and thinner flanges. With care, backing paper can be reused many times. Another alternative for 616 models is to convert them for use with 120 film. Peter Lerro has documented his design that exploits the large 616 film gate by installing a new film mask and roller extensions . The 620 Monitor also requires film rerolling, but this is a simpler operation requiring only that you reroll currently available 120 film and its backing paper onto 620 spools. As noted on the Tourist page, finding a folder that suits you is a matter of tradeoffs. As Chris Perez notes in his tradeoff analysis, while a used Mamiya 6 costs about $19/line/mm, his used Kodak Special 620 with an uncoated Anastigmat Special cost about two orders of magnitude less-- $0.23/line/mm. This is in a package that weighs a little over a pound and, closed, is a little larger than a Leica M4.